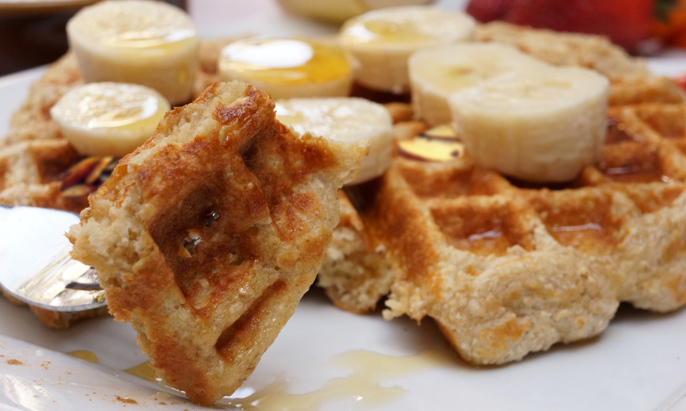 Looking for a completely oil-free healthy waffle that will energize your workouts and make your taste buds dance? Mix milk, yeast, ginger, and sugar in medium bowl to blend. Let stand until foamy, approximately 10 minutes. Mix both flours, oats, cinnamon and salt in a large bowl. Add yeast mixture; stir to blend (batter will be thick). Cover and chill at least 1 hour or overnight. Preheat Belgian waffle iron according to manufacturer's instructions. Next, mix egg whites, melted butter and baking powder into batter. Spoon 1 cup batter onto iron; spread with spatula. Cover and cook until golden and cooked through, approximately 4 minutes. Transfer waffle to baking sheet and keep warm in oven. Repeat, making 6 waffles total. Top with almonds, yogurt, bananas, and honey. Enjoy!